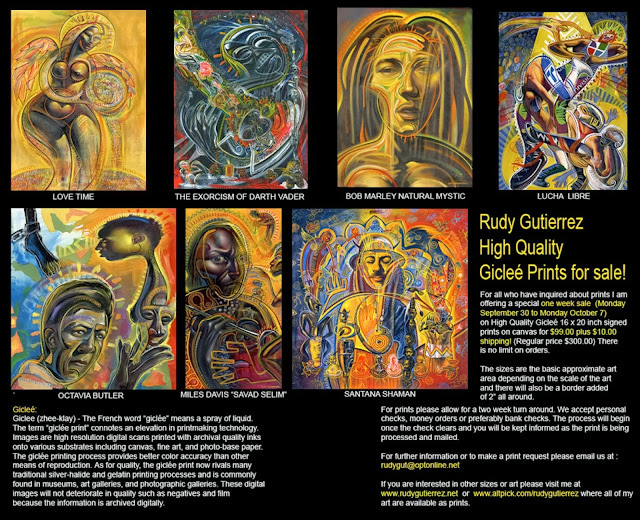 RICHARD SOLOMON ARTISTS REPRESENTATIVE: Rudy Gutierrez - Giclee Print Sale! Rudy Gutierrez is discounting his signed Giclee prints for just one week from $300 to $99. There are no limits to the quantities or images and would make a great gift. Sale ends on Oct 7th. "There is no limit on orders. Please see attachment for art selections and follow or friend me on Facebook for another sale on John Coltrane prints this week! once the check clears and you will be kept informed as the print is being processed and mailed. I am planning to periodically offer selected prints for sale in the future as well. art are available as prints.